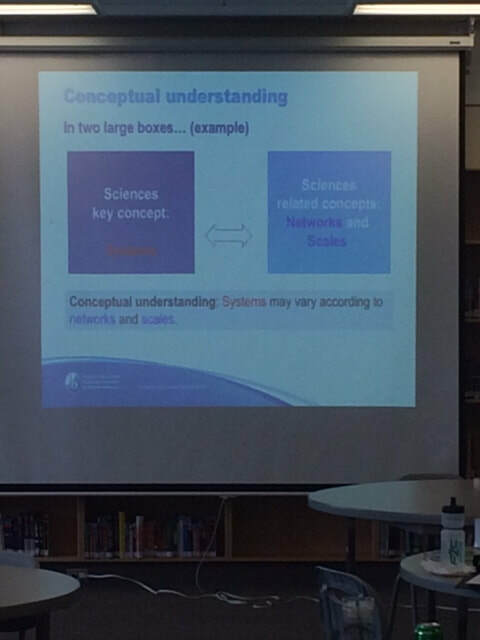 On September 29th, the PMSS staff met to learn and develop our understanding of the International Baccalaureate framework for teaching. Mrs. Bevington distributed two helpful handouts that assisted the staff as they navigated the day. They are available below. To start the session, we viewed a video by Sir Ken Robinson meant to frame our day. The film, asked teachers to discuss paradigm shift in education. After viewing the video, we discussed how the RSA animate changed or validated our thinking about education. Next, we examined the IB mission statement and discussed how it fit with our teaching philosophies. Next, we examined the IB learner profiles as a group. We then did an activity where we examined in groups which learner profiles we felt most strongly about and then wrote down what are some of the attributes of each one of the profiles. Then, wrote down indicators of what it looked like and examples of if it was occurring in our classrooms. Here are examples of our thoughts on the learner profiles, what they mean to us and what they might look like/ do look like in our classes. We wrote them on large paper and put on the walls. Below is a slideshow of pictures to scroll through that shows our examples. Midway through the day we developed an understanding of why the "I" in IB. Indeed, why should we have an international component to our education. Groups were tasked with sharing their views on large pieces of paper, then we reported out as a staff. Scroll through the pictures below. Next, we engaged in an activity where staff were given an iPad and a chance to look at their resource guide for their subject. We also looked at how some guides contained similar concepts. Below are easy to access versions of each of the resource guides for each of our subjects. Next we examined how to create a unit plan based on the IB Philosophy. Attached are copies of the template in PDF and Word for your convenience, you may download. If you print the PDF, you can write in it the old fashioned, tried tested and true way. If you download the planning template in word, you can type into the template if you are into digital resources... and sometimes being angered by technology which can frustratingly delete all your hard work at 2am when you are already stressed. Then, we made a statement of conceptual understanding. For instance, in Language and Literature, we wanted to explore they key concept of "Perspective" and decided to explore it though the Related Concepts of "Character, Setting and Theme." And example from science is below. We also looked at a document called "Principles into Practice" which helped support our understanding of MYP. We linked it to our Subject Specific Guides. We spent some time in our groups and examined key concepts, related concepts and statements of understanding. This is the underpinning or overarching ideas behind each unit. They are not subject specific. But provide key large learnings that are transferable. 3. How can students apply lessons learned about resilience to their own lives, community and global context.